Dental MythBusters: Do Dentists Have a High Suicide Rate? Is this merely a joke or is there some truth to dentists having a high suicide rate? Earlier this week a patient asked me about this dental suicide statistic about which everyone seems to have heard something, but nobody actually knows anything. I’ve been aware of this perception long before the day I declared my interest in going to dental school, but I’ve never been interested enough to actually research the issue seriously. I always suspected that there was some statistical anomaly, sample size issue, inside joke, or other reason to account for the data, but I had to confess that I really didn’t know. An Oregon study done in the 60s, which showed Oregon dentists to have the highest suicide rate among professional groups in that state, seems to have sparked all of the suicide interest in dentistry. A 1971 national study by the U.S. Public Health Service found dentists to have the third highest suicide rate (behind managers and police officers) of 36 occupations. According to a 1973 California study, California dentists ranked third in suicide rate (behind chemists and pharmacists). In 1984 Dental Management magazine published the results of a survey, which showed 7% of dentists considered suicide at some point in their careers. In 1996 a sociologist from Wayne State University analyzed public health service data and separated factors of age, race, gender, and marital status from occupation and concluded that just being the dentist in the United States raises suicide risk by 564%. In 2011 Business Insider searched the entire database of the National Institute for Occupational Safety and Health to study cause of death. Data on deaths from 1984 to 1998 suggested that American dentists rank number three in suicide rate (behind marine engineers and physicians). According to this study, dentists are 1.67 times more likely to commit suicide than the population average. This is by far the most cited study you’ll find on the internet. In 1971 the ADA investigated suicide data from 31 states. The results showed that dentists did not have a higher suicide rate in terms of statistical significance. In 1977 the ADA’s Bureau of Economic Research and Statistics found the overall death rates of dentists to be lower than the general population and the life expectancy to be higher. In 2001 the ADA published an article which reviewed numerous relevant studies on dentist suicide and concluded that the evidence to suggest dentists have a higher suicide rate is weak. The article specifically addresses stress-related suicides, which is the presumed cause of a higher dentist suicide rate. Right from the start I noticed that there is disparity between what the American Dental Association says and what outside groups report. No other group gathers more data from, and knows more about dentists than the ADA, but at the same time, could there be a little bias involved to promote the profession? I’m not sure of the answer, but given the ADA’s research-based position on everything else I’ve ever seen, including their honesty in matters that show dentists in an unfavorable light, I tend to trust them. It should also be noted that suicide statistics are also notoriously hard to compile. Not all states report death data the same and suicides go unreported more often than not, so the actual numbers are likely to be much higher than we think they are for all professions. Additionally, suicide mortality statistics do not include unsuccessful attempts (e.g. “attempted suicide” for the purpose of gaining attention, etc.) which makes the data even harder to interpret. Do dentists have a higher suicide rate? The data seem to indicate so to me, but to this point, I’m not confident in the means which lead to this conclusion. 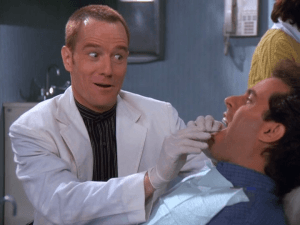 One thing I don’t buy is that some within the profession perceive dentistry to be more stressful than other occupations and, like fictional Tim Whatley, they cite the suicide statistic as evidence of this. Yes, managing a small business can be stressful and the financial requirement to go to school, buy a practice, and keep a practice running is daunting. The intense perfectionist attitude required to fix teeth properly can become a stress-inducing permanent mindset, and if permitted, work can easily overflow and put strain on family, church and other facets of a dentist’s life. That being said, the most stress I’ve ever felt in my life was at BYU where I did school full-time, work part-time, and tried to keep some semblance of a social life going at the same time—just like everyone else! Don’t believe that dentists are under any kind of extraordinary stress. Stress comes to everyone through life, jobs, family, and a variety of other factors. I sincerely don’t believe dentistry to be any more stress-inducing than most other occupations, and in fact, I find it to be extremely rewarding and worth every bit of effort I put into it. On the other hand there’s a dark side of this stuff that I haven’t yet addressed: depression. I cannot downplay the increasing evidence that many people struggle with depression, severe anxiety, and a myriad of other psychological conditions that might lead one to suicidal thoughts. I’ve never felt crippling depression once in my life, but I have friends who do struggle with it; it’s a very real thing. Are there more depressed dentists per capita than other occupations? Does dentistry somehow attract more individuals that are predisposed to such things? These are questions that won’t be answered for a while. I can't wait to meet you! I'm Dr. Nick Young and I've been here at Canyon Gate Dental since 2010. I initially joined Dr. Payne as an associate dentist and was so impressed with this great office and amazing patient family that I wanted join the team for good. I became an official partner of the practice at the end of 2012 and I love my job. As a general dentist, I enjoy all specialties of dentistry, but I like emergency dentistry in particular. It's so satisfying to help people look and feel great and also help them get out of pain. I'm from Provo and attended Brigham Young University for my undergraduate degree and the University of Louisville for dental school. I've been married for 9 years to my beautiful wife, Heather, and we have two young children. My favorite thing to do is be a daddy and rough house with my kids, but I also enjoy playing golf, watching football and basketball (Go Cougs! ), and going on dates with my wife.